On March 26, 2019, at least four Communist Party of India-Maoist (CPI-Maoist) cadres were killed in an encounter with Security Forces (SFs) near Karkanguda village under the Chintalnar Police Station in the Sukma District of Chhattisgarh. SFs recovered bodies of four Maoists along with one INSAS (Indian Small Arms System) assault rifle and two .303 rifles from the encounter site. The identities of the slain Maoists are yet to be established. On March 21, 2019, two members of a family were killed and another two sustained injuries after cadres of the People's Liberation Front of India (PLFI), a splinter group of the CPI-Maoist, barged into their house in Turundu village under the Kamdara Police Station in Gumla District of Jharkhand, and opened fire hours after Holi festivities concluded. Police suspect that the refusal to pay ‘levy’ (extortion) was a probable reason for the attack. On March 19, 2019, a woman CPI-Maoist cadre was killed in a brief encounter with SFs in the forest region under Gatapar Police Station area in Rajnandgaon District of Chhattisgarh. After the encounter, the dead body of a woman Maoist, identified as Jamuna aka Sagan Bai (45), carrying a reward of INR 800,000, was recovered from the encounter site, along with an automatic weapon. 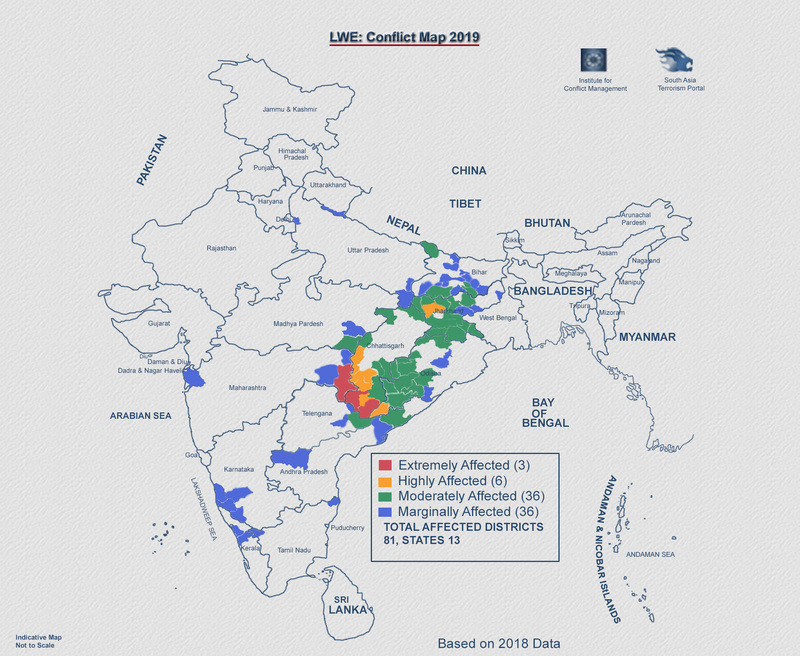 According to partial data collated by the South Asia Terrorism Portal (SATP), at least 72 persons have been killed in Left Wing Extremism (LWE)-linked violence across the country in 2019, thus far (data till March 31, 2019). These included 20 civilians, two SF personnel and 50 Naxalites (Left Wing Extremists). During the corresponding period of 2018, such fatalities stood at 96 (28 civilians, 27 SF personnel and 41 Naxalites). There were a total of 413 fatalities (109 civilians, 73 SF personnel, 231 Naxalites) in LWE-linked violence across India in 2018, as against 333 fatalities (109 civilians, 74 SF personnel, 150 Naxalites) in 2017. Total LWE-linked fatalities stood at 433 in 2016; 251 in 2015; 314 in 2014; 421 in 2013; 367 in 2012; 602 in 2011; and 1,180 in 2010 – the highest recorded in a year since the formation of CPI-Maoist in September 2004. Annual fatalities have followed a cyclical trend since 2010, and, indeed, earlier as well. The number of civilians killed in both 2017 and 2018 remained the same, 109 each. However, SFs secured an improved kill ratio in 2018, at 1:3.16, as against 1:2.02 in 2017. The 2018 ratio is the second best recorded, with the best at 3.69, in 2016. Out of 28 major attacks (each involving three or more fatalities) recorded in 2018, 15 were initiated by SFs, while 13 were initiated by the Naxalites. These 28 incidents resulted in 157 deaths: eight civilians, 36 SF personnel and 113 Naxalites. In 2017, only four major attacks were initiated by SFs, while 11 were initiated by the Naxalites and four remained unspecified. These 19 major incidents had resulted in 122 deaths: six civilians, 52 SF personnel and 64 Naxalites. Clearly, the SFs intensified their operations during 2018, even as the Maoists were forced into a retreat. Out of 231 Naxalites killed in 2018, those of ‘commander’ ranked was 28. In 2017, a total of 27 ‘commander’ ranked Naxalites were killed out of a total of 150 Naxalites killed. Since 2010, out of 1,619 Naxalites killed, 149 were of ‘commander’ rank (data till March 31, 2019). 128 incidents of arms recovery by SFs were recorded in 2018, in addition to 294 such incidents in 2017. In 2019, another 47 such incidents have already been recorded. SFs arrested 786 Naxalites in 288 incidents through 2018, in addition to 870 arrested in 356 incidents through 2017. In 2019, as on March 31, 2019, the number of arrests stood at 94 in 42 such incidents. Mounting SF pressure has also resulted in 480 Maoist surrenders in 85 incidents through 2018, in addition to 543 such surrender in 92 incidents through 2017. In 2019, as on March 31, the number of surrenders was 41 in 18 incidents. According to data provided by the Union Ministry of Home Affairs (UMHA), there were a total of 833 LWE-linked incidents in 2018 as against 908 incidents recorded in 2017. The number of total incidents was 1,048 in 2016; 1,089 in 2015; 1,091 in 2014; 1,415 in 2013; 1,136 in 2012; 1,760 in 2011 and 2,213 in 2010. The figure of 2010 was the highest ever recorded in a year since the formation of the CPI-Maoist on September 21, 2004. 74 incidents had already been recorded in 2019, by January 31. On April 16, 2018, UMHA announced, that 90 Districts in 11 States were affected by LWE violence. The maximum of 19 Districts were in Jharkhand, followed by 16 Districts in Bihar, 15 in Odisha, 14 in Chhattisgarh, eight in Telangana, six in Andhra Pradesh, three each in Kerala, Maharashtra, and Uttar Pradesh, two in Madhya Pradesh, and one in West Bengal. on February 5, 2019, UMHA again released the same list. Significantly, on June 2, 2014, UMHA had released a list of 106 LWE-affected Districts which according to UMHA’s release, had further increased to 126 in 2017. (principally as many Districts were bifurcated thereafter). Moreover, on April 16, 2018 MHA listed 36 Districts as “worst affected”. The list was updated on August 1, 2018, categorizing 30 Districts as ‘worst affected’. MHA’s February 5, 2019 release, indicates that violence was reported from 90 Districts in 2018 as against 223 in 2008. According to SATP, though the number of extremely-affected Maoist Districts increased from one in 2017 to three in 2018, highly-affected Maoist Districts declined from nine in 2017 to six in 2018. Moderately-affected Maoist Districts increased from 30 in 2017 to 36 in 2018, while marginally-affected Maoist districts declined from 68 in 2017 to 36 in 2018. Disconcerted by the weakening movement, the Maoists replaced Muppala Lakshmana Rao aka Ganapathy, the 71-year-old ‘general secretary’ of the CPI-Maoist, on November 5, 2018, with his ‘second-in-command’ Nambala Keshava Rao aka Basavaraj (63). Basavaraj was heading the CPI-Maoist's ‘military-wing’, PLGA (People's Liberation Guerrilla Army), since its inception. He is also suspected to be behind almost all major Maoist attacks that have taken place in Chhattisgarh, Maharashtra and Odisha in the recent past. Basavaraj is an expert in explosives and military techniques and has a good network with arms traders. He also has a reputation for greater proclivity to violence than Ganapathy. The affected States and Union Government launched a number of new initiatives on the security front in 2018, in addition to several measures undertaken over past years. Most recently, on February 13, 2019, the Union Government informed Parliament that, to provide better mobile connectivity in LWE-affected areas, the Union Cabinet had approved INR 73.3 billion plus applicable taxes, and UMHA had identified tower locations in the LWE-affected areas in 96 Districts across 10 States. On January 8, 2019, the Union Government disclosed that in 2017-18 it launched a new scheme, the ‘Special Central Assistance for the most LWE Affected Districts’ to fill up critical gaps in Public Infrastructure and Services with an outlay of INR 30 billion @ INR 10 billion per annum. Earlier, on March 21, 2018, the Government had informed Parliament that, under the Road Requirement Plan-I (RRP-I), of the sanctioned 5,422 kilometres roads in 34 LWE affected districts, 4,537 kilometres of road had been completed, while the remaining 885 kilometres were ‘under construction’. On March 21, 2018, the Union Government stated that, to boost education, at least eight new Kendriya Vidyalayas (KVs) were sanctioned, of which seven were already functional, and another three KVs are likely to be sanctioned shortly. Also, at least five new Jawahar Navodaya Vidyalayas (JNVs) were sanctioned for LWE affected districts, and all of them were functional. The Centre was confident of overcoming the ultra-Left problem in the next three years through its existing two-pronged policy – development and police action – to deal with the menace in the affected areas. The intermittent audacious attacks of the recent past clearly indicate that the Maoists still possess the wherewithal, albeit diminishing, to strike at will. On October 30, 2018, three Policemen were killed and another two Police personnel injured, in a CPI-Maoist ambush at Nilawaya near the Sumeli Camp in the Dantewada District of Chhattisgarh. Doordarshan (DD) News cameraperson Achyutananda Sahu (34) from Loisingha in the Bolangir District of Odisha was also killed in the attack. The Maoist movement has weakened, as the SFs now dominate areas long under LWE sway. Nevertheless, the capacities to sustain dominance remain deficient. According to Bureau of Police Research and Development (BPR&D) data, the all-India Police-population ratio was 150.75 (as on January 1, 2017), in comparison to 137.11 per 100,000 on January 1, 2016. Some of the Maoists affected States have much worse police-population ratios: Bihar, at 74.76; and Odisha at 132.87. Even in States like Jharkhand, where the police-population ratio, at 174.96, exceeds the national average, it remains much lower than the 220/100,000 ratio regarded as desirable for 'peacetime policing'. The number of vacancies across the country, in the apex Indian Police Service (IPS) was 938, as on January 1, 2017. Moreover, huge vacancies persist in the entire Central Armed Police Forces (CAPFs), which have been increasingly used in fight against the Naxalites: 166,896 vacant posts as on January 1, 2017, against a sanctioned strength of 1,154,393 (actual strength: 987,497). Significantly, against a sanctioned strength of 322,066, in the CRPF, the lead counter-insurgency Force in the country, the actual strength stood at 296,404, a vacancy of 25,662 personnel. Stark deficits are noticeable in some of the worst afflicted States. According to the BPR&D, as on January 1, 2017, there were at least 126 Police Stations in Chhattisgarh, the worst Naxalism-affected State, which did not have a vehicle. Similarly, the second worst affected State, Jharkhand, had 23 such Police stations. The number of Police Stations without telephones in these two States was 23 and 64, respectively. The Maoists are certainly in retreat, but the threat is still alive. Sadly, the state appears to lack the sense of urgency required to build the capacities to sustain and consolidate the gains of recent years.